I’m excited to announce the release of four new Continua sculptures, the first in a series of wall pieces that will become available in 2018 and 2019. Visit my online shop to view the first installment of sculptures: Continua 23.1 - 23.4. Continua is an acclaimed installation that has been exhibited nationally and acquired by noteworthy public and private collections. I created Continua by transforming 900 discarded phone books into an immersive color experience. These new small-scale pieces offer a more intimate glimpse into the work by shifting focus from the vastness of the whole color spectrum to the subtle nuances contained in each book. Continua is a landmark piece that helped me to define a personal working process in which I elevate humble materials into majestic works of art that reveal the strange and complex beauty intrinsic to all things. Discarded objects such as phone books are unremarkable, even repugnant to some, yet for me have the potential to speak to the deeper aspects of human experience. I created Continua in my South Philadelphia studio between 2009 and 2011. On my daily walks in the city I was drawn to the unwanted phone books left out on stoops and sidewalks. Exposure to the elements caused the pages to warp and curl until they began to resemble geological strata. These weathered phone books provided me with an image of time as a sequence of moments that was instinctively familiar; individual, yet connected to the past and the future. At the time I was teaching courses in color theory at Tyler School of Art and the color progressions that my students were painting offered yet another way to visualize time as a spectrum. 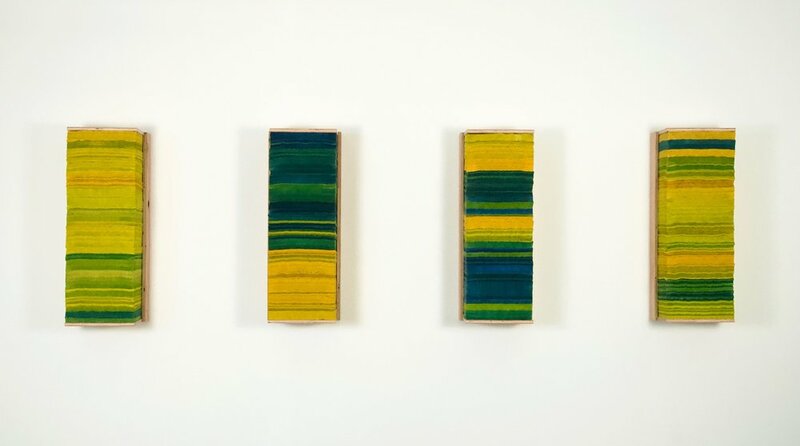 In the studio, I experimented with painting and stacking the phone books, which led to my discovery that the pages could provide a medium for the flow of color in three dimensions and a metaphor for time. 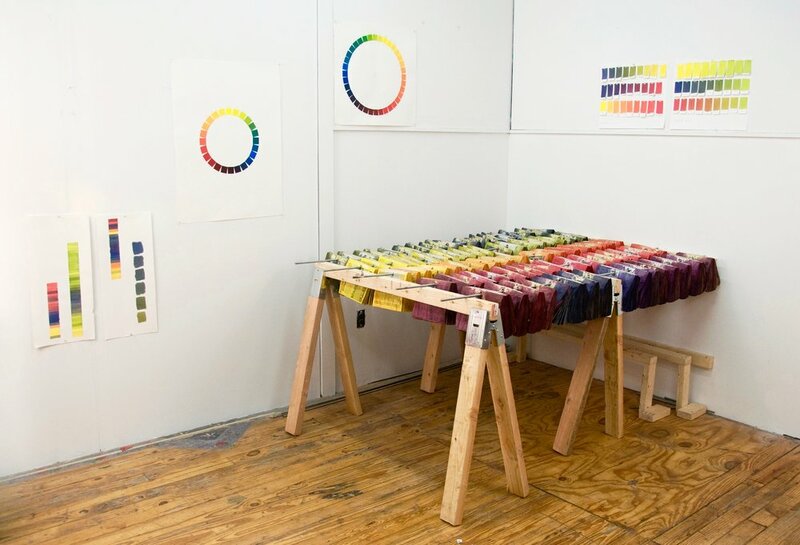 I used the geometry of the color wheel as the foundation for my color combinations and developed an analog system or “color game” to determine the sequencing of colors in each of my stacks. Through this rigorous and systematic process, I used color as the means to transform a mundane and familiar material into a sculptural monument to the collective human experience of time. It’s been a thrill to exhibit this work in diverse venues throughout the US, including The Carnegie Museum of Art, Grounds for Sculpture, The Soap Factory and William Paterson University Galleries. I created each installation in response to a unique architectural space, which has resulted in a continually evolving conversation between color, space and time. Now I hope to continue the conversation on a deeper level by creating a more intimate dialogue that emphasizes the physical presence of each color as a moment in time. Check out the links below to learn about the many dimensions of Continua via interviews, blog posts and reviews!